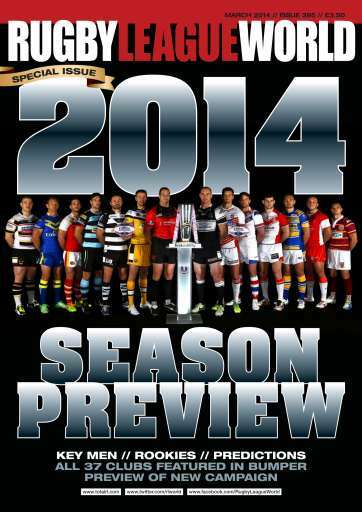 The 2014 season is now underway – and Rugby League World provides the biggest and best guide to the new campaign. We look at all 37 professional clubs over the course of a bumper 26-page preview, covering every close season transfer move and assessing each club’s prospects. 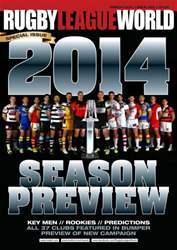 We also give each club a predicted finish ahead of one of the most important seasons in memory. Elsewhere in another packed edition, we reveal planned changes to the dual registration system, while Dave Hadfield takes a loving look back at the old days of Alliance Rugby League. Jamie Jones-Buchanan sits down with Wakefield’s testimonial recipient Andy Raleigh, and Scott Moore tells Nigel Wiskar about his new life in London. We look ahead to Wigan’s World Club Challenge against Sydney Roosters in Australia, and Robbie Hunter-Paul gives his new view on the new campaign. In the Championship we ask Steve Maden about his decade-long association with Leigh Centurions, and there are the usual updates from Australia, New Zealand, France and Wales as well as a look at the Women’s and Academy scenes.